At Washington State University, one faculty member recently put together a semester plan that opened her classroom to a larger community of practice in her field. This pioneering faculty member engaged students and industry professional colleagues as well as faculty in her department in a transformative and authentic (real life) project in an upper division Apparel Merchandizing class. These three groups--her students in the class, faculty colleagues in her department, and people already out in the field--formed into a community of practice to provide feedback to the students that was broad-based and industry-current, and which therefore engaged professional community standards. The professor used a portfolio approach, but don't be surprised at what technology she considered a portfolio tool as you read her story. And don't be surprised that the students were not the only learners enlightened by the project that went beyond the ivory walls. She worked with WSU's Center for Teaching, Learning, and Technology (CTLT) to help get the course set up. As a faculty member in WSU's Apparel Merchandizing and Design Textiles department interested in rich and authentic learning environments, she had the background to attempt this fairly ambitious plan. She believed that the goal of the market forecasting class could be leveraged by using a blog as a portfolio authoring tool and then a harvesting gradebook (http://wsuctlt.wordpress.com/2009/01/20/harvesting_gradebook/). The harvesting gradebook affords students with a way to access feedback from around the globe in real time via a dashboard adapted from the WSU Skylight application. The project engaged 80 students in 15 teams working on a semester-long design project. Each team used WordPress blogs to create an electronic poster portfolio presentation (see poster template, below) of their work at midterm for formative (in process) feedback and then created a revised electronic poster as a final project. Eight industry professionals (including one who posted an introductory video to introduce the project, having, as Chida, one of the authors, noted, "a positive impact on the students") and seven other faculty provided feedback to the posters using a rubric (a set of criteria) derived from WSU's critical and integrative thinking rubric (http://wsuctproject.wsu.edu/ctr.htm). In addition, students used the rubric for self and peer evaluations. Even the professor in this course was surprised by how well this process worked. The opportunity to harvest feedback for students from professionals distributed around the globe, the professor noted, "opened my mind to an entire new way of teaching." The industry reviewers were also impressed. One in particular asked for her business to be kept in mind as a future destination for students as they "are always looking for talent to recruit." The results that the CTLT found are rich with insight into student learning because the Center was able to see how the process was perceived by the four groups (students, their teacher, her departmental colleagues, and her colleagues in the profession) involved in this study. The figure below illustrates just one outcome--students' learning gains as perceived from potential employers who assessed their projects at midterm (blue) and again at the end of term (red) after students had received and responded to the feedback from peers, faculty, and the employers. Assessments at midterm are overlaid with assessments at the end of the course. What we see is that the industry professionals improved their perception of the students significantly after the students had received feedback. 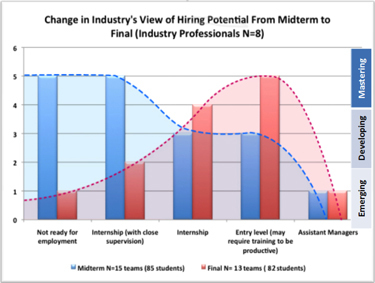 The learning gains reflected in the increase (red) of students whose work meets professionals' expectations for internship, entry level, and even leadership positions demonstrate the power of the approach. Yet there are other implications worth noting. As Grant Wiggins (President of Authentic Education, http://www.grantwiggins.org/about/grant.html) has pointed out, we often conflate standardization with high standards. This process illustrates that high standards can also be applied to students working in teams doing things in their own ways, constructing their own understanding of professional success and in many cases, with input from peers, faculty, and pros, realizing that success. But even faculty and professionals identified gains in their own understanding, their own lifelong learning. This entire community of practice learned from the experience. The process described is based on portfolio thinking and planning. The premise of portfolio thinking is that the evidence students create about their learning is a vital data point, just as vital as tests or other measures, in assessing their learning. The promise of ePortfolios and portfolio thinking is great and is emerging, but two clear observations and one critical question emerge. First, using ePortfolios in communities of practice can do much to advance students' learning as measured by criteria and consensus among faculty, students, and those who would hire them. The gains are compelling. Second, engaging stakeholders (i.e., the community of practice described in this story) in establishing and validating a shared discourse around principles of quality provides a rich and useful way to distribute the legitimate need for greater accountability in education. Strategies for continued improvement emerge clearly when using this ePortfolio approach and are available immediately to those in positions--faculty, employers, students--to do something about what the assessment reveals. Further, unlike standardized measures that abstract learning and extricate responsibility for improvement from the assessment process, the ePortfolio approach leverages the insights and energy of key stakeholders to improve toward commonly understood levels of abilities. 1. The student becomes the central figure in the learning equation, not the faculty member. 2. Assessing and evaluating becomes the responsibility of the community of practice and not solely of the faculty member. 3. The community of practice sets the assessment criteria, not just the faculty member. 4. The student receives grade-determining feedback from the community instead of just from the faculty member. 5. This community of practice, then, becomes the implicit credentialing authority that the university facilitates. 6. Artificial semester boundaries do not start and stop the work of the community of practice nor the ongoing problem engagement. 7. Student work is more widely shared than in a traditional classroom setting. 8. Faculty are not the gatekeepers to the community of practice since, once students are brought into the community by the faculty member, they continue their participation. 9. Student learning is social and therefore learners are building social capital in the community of practice well before they formally enter the field. What is less clear and yet no less exciting is the way this process begins to assuage Dewey's fear that education might adopt only a reflecting role and forfeit its societal shaping function. Though this process challenges traditional faculty, student, and even employer roles in promoting relevant learning, the rewards of doing so make the effort worthwhile. Theron Desrosier, Nils Peterson, Meriem Chida, and Gary Brown all work at Washington State University's Center for Teaching, Learning, and Technology.